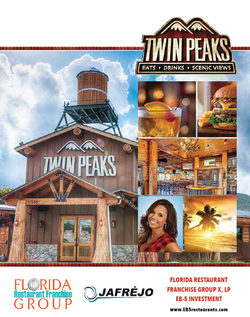 The Florida Restaurant Franchise Group 10, LP is a Limited Partnership that was established to provide funding for the development of two “Full Service” restaurants in South Florida under the national restaurant franchise name of Twin Peaks Restaurants. The proposed investment offers EB-5 candidates the opportunity to participate in the development of the commercial Real Estate of the first Twin Peaks Restaurants in South Florida. The project will create 17.5 jobs per investor.